Purple thunderclouds, the scent of rain, hand-rearing baby weavers, baby springbok taking their first steps, hunting for omajovas, carpets of yellow flowers… and lilies. 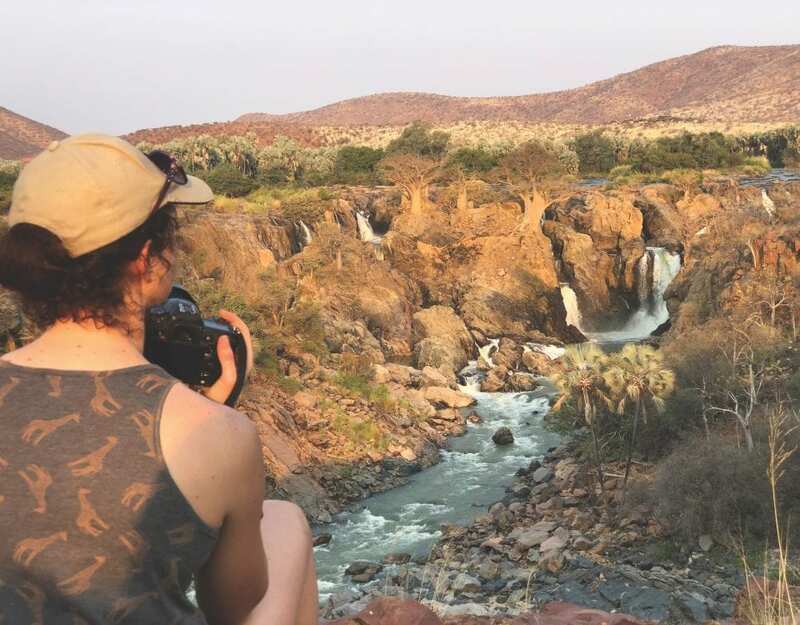 These are a few of my favourite things about summertime in Namibia. Growing up in Cape Town, I had become spoilt by greenery, so you’ll forgive me if I don’t add the equally magnificent summer grasslands to my list. Being accustomed to the Cape fynbos of my youth, it took me several years to notice that Namibia had a spectacular flower show all of its own. 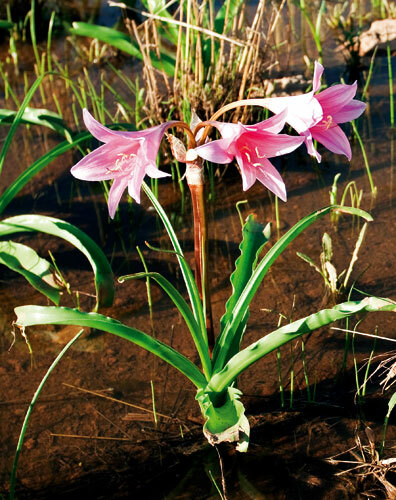 When living in Omaruru some years ago, I started noticing some pink rather handsome-looking lilies appearing after the short October rainy season. This brief preview of blooming in November was a taste of things to come and a miracle in its own right, exposed by a few lilies rushing to complete their annual cycle before crisping up in the baking December sun. This beautiful lily specimen was the Crinum buphanoides, a member of the amaryllis family (Amaryllidaceae). It grows in sandy and marshy areas in northern Namibia, and the plants surface only a couple of weeks after a really good soaking of rain. Once they blooms have become dried out and shrivelled, we start the long wait for the real summer rains to begin… watching as the clouds move in promisingly from the east, only to stop directly overhead! Omaruru seems to be a kind of watershed for the clouds – we are taunted by the promise of heavy, thunderous storms to the east, while clear blue skies sparkle a few kilometres away to the west. It’s enough to drive any Capetonian sufficiently crazy to head off down south! By now we’d had many months of dry, sunny and mostly cloudless days behind us after the last rains in April. But I knew that soon the oppressive heat would break and those who sat it out, by choice or otherwise, would be treated to one of nature’s spectacular annual displays – the first rains of the year and all the treasures that are then released from Earth. 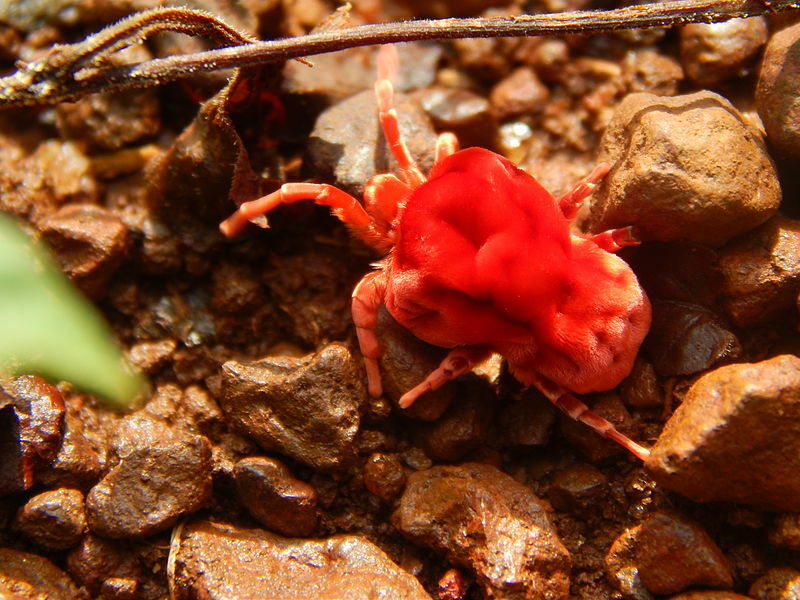 First to appear in my Omaruru garden were always the red velvety mites, simply popping up from the soil overnight. Where had they been hiding all year? They scurried about their business in a certain area of the garden for a week or two before disappearing again as mysteriously as they had come. After a really good first shower, termites started streaming out of small holes in the ground and hit the air flying, so to speak! They came in an endless swarm and flocked to the nightlights, where by morning most of them had shed their wings and scurried away to start a new life cycle, leaving us piles of fading iridescent wings to sweep up. About two to three weeks after the first good showers, it was time to go over to the old battlefield near the Franke Tower and Omaruru Guesthouse (in former years known as the Staebe Hotel) and see how the annual rebirth of the lilies was progressing. By now the ground was covered with the first green haze of grass. Here and there swathes of fat juicy leaves had appeared, announcing the arrival of Crinum buphanoides to delight the locals for another season. Buds dripping from the night’s rainfall were a delight to photograph. Then the work began for me, as in being up before sunrise every morning for the next week at least, to have the tripod and camera set up just before the sun rose. Every morning the same people crossed the lily fields on their way to work, taking their children to school, or walking their dogs, and after a few days we greeted each other like old friends, as I pointed out a new specimen or an exceptionally full bunch of pink lilies. Some, I realised, hadn’t noticed the beautiful lilies before, even though they used the path daily. I spoke to Omaruru residents who didn’t even know of their existence! Hopefully this has now changed. Ironically though, while I was photographing them in 2008, their full flush of magnificence coincided with the date of a battle between the Germans and Hereros, 100 years previously. The lilies now marked the spot where so many people had fallen in the tragedy of war. As I wandered around amongst the knee-deep pink carpet, I wondered if there had been lilies here a hundred years ago…. This is probably not the sort of detail that’s recorded in history books. As the rain continued and ever more lilies appeared, I found clusters in huge pools of water. While photographing them I was treated to a symphony of frog calls while the rain began to fall softly again. Pure magic! Then we moved to Windhoek, and closer to another of Namibia’s lily spectacles. I was more than eager to capture the next lily show on camera. 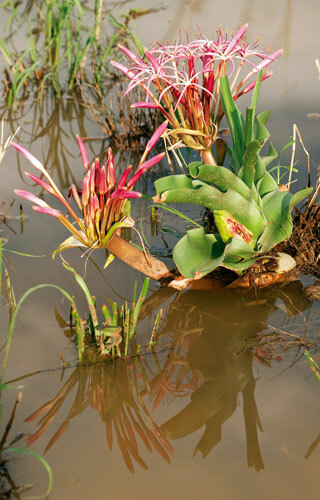 This time it would be Crinum paludosum, undoubtedly Namibia’s most famous lily. Forty kilometres north of the town Maltahöhe is Farm Sandhof, which has an unusual and special attraction. On a pan-like area of some 800 hectares, this particular species is found, and it flowers only after very specific climatic events. I kept hearing and reading the same story about these lilies, and soon realised that it would take careful planning and research to actually get to see this special show. So I joined the lily enthusiasts and started calling the Maltahöhe Hotel on a regular basis to hear what was happening down south. Owner Arno was happy to oblige and never seemed to tire of answering my many enquiries and emails regarding the lilies. It takes a minimum of 30 cm of rain to fill the pan sufficiently for the dormant bulbs to start developing. Then it takes only five to seven days of fervent growing activity before they start to flower. Once they start, you have about three days to capture the lilies photographically in their many shades of pink, stretching as far as the eye can see. As you can imagine, getting your ducks in a row to see this spectacle is no mean feat! Finally we set off on our quest, which just happened to coincide with a trip to Cape Town, so a stopover en route seemed to fit in nicely. 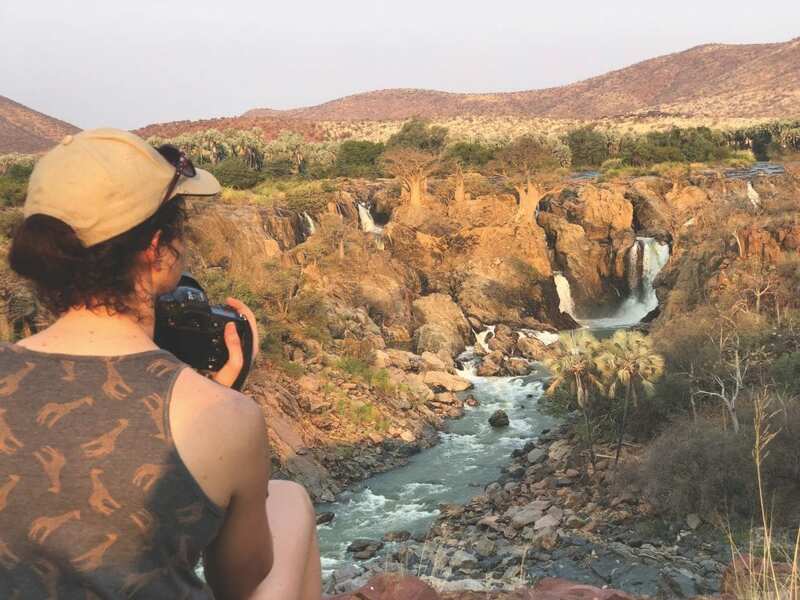 We arrived at the oldest hotel in Namibia in just the nick of time, said Arno. After lunch we set off, armed with sunhats, tripods and cameras… and a tangible sense of anticipation. A few storm clouds were gathering on the horizon. Arno had cautioned us that there might be deep pools on the road. After negotiating through a couple of long, narrow ones (we were in a sedan), we arrived at the farm gate, where we were greeted by two smiling young girls in a small makeshift shelter. There was an impromptu arrangement of lilies in a vase – proof at last that these elusive lilies were indeed in flower! After buying a lily T-shirt from the girls, we were on our way again, and arrived as the first clouds started moving in overhead – great for photography! We soon realised that to get the shots we were after, we would have to wade to the middle of the lily field closest to us. It was about 100 metres away. Fifteen minutes later, after a slow trudge through calf-deep water and mud that sucked at our shoes and sent us sliding this way and that, we arrived, well sort of, in the middle of even more water and mud! Fortunately I could hang my camera bag on the fence we had been following, and so began the most difficult three hours of photography I had done in a while, not least of all because there was just nowhere to sit and take a rest. But the silence and atmosphere more than made up for it. Being surrounded by pink lilies in all stages of flowering, was like being a kid in a sweet shop. We simply didn’t know which one to photograph first. As the hours passed by, I saw a heron fishing further in the pan and then a sweet twittering sound filled the air. A small flock of black-winged stilts glided gracefully over the pinkness, followed by silence. Here and there small iridescent green beetles flitted between the flowers, and eventually I spotted what I had been searching for – an ‘elephant’ beetle (also known as the red lily weevil), Brachycerus ornatus. He is a large rotund fellow about five centimetres long with a ‘nose’ resembling an elephant’s trunk. He was munching his way through a beautiful fresh cerise bloom, and was soon done, after which he moved on to the next one. 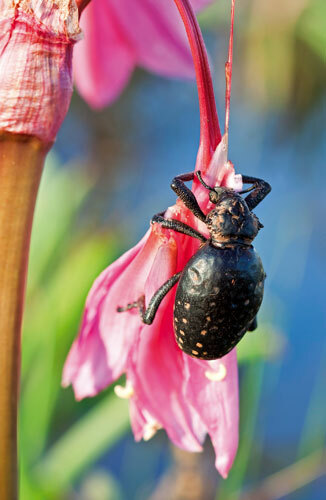 I had been told that when the flowers were at their best, there could be several thousand of these beetles at one spot. I wasn’t sure I’d like to continue wading barefoot in the mud, as I’d already lost one of my flip-flops! Just as the light started fading and we began making our way back to the car, the clouds and sunset put on a spectacular display of reflections in the water. This year there was more grass than usual though, distorting the reflections – probably the result of steady rainfall before the required 30 centimetres of water arrived. The rising wind started whipping the lilies into a pink flurry. By then it was time to go and clean up at the comfortable Maltahöhe Hotel and indulge in a well-deserved dinner. Lilly photography is rewarding but don’t underestimate the hard work! I discovered I had lost two rubber feet off my tripod – they had been sucked into the mud along with my flip-flop, and unfortunately the tripod had sucked up tons of sand into its hollow legs and would now have to be used specifically for lily shoots! Oh yes – I’m already looking forward to next year’s lily trip. A tip – cover the feet of your tripod with rubber or plastic before you go, and wear old clothes, because the red-rown mud will ruin everything. Together, these three species of Crinums are the most common and easily seen in Namibia, if only for a brief period of time. Actually… part of the fun is getting your timing right.